Okay, if you ask any horse owner about their veterinarian you will probably hear “Oh I love my vet He/She’s the best!” It’s Kinda funny everybody’s vet is the best in the world, and it may be true since we develop strong bonds with them and we rely on their talents to care for our horses. So, with that said… I love my Vet! Why, because he takes the time to explain what needs to be done. That’s very important for a person who has limited knowledge about horses. See, Briar is the rider and really understands her horses. It’s like driving your car, once you have driven that car for a period of time you start feeling the little changes and just know when something is off. For me, I rely on Briar to let me know if she thinks something is off. Of course, the obvious things I can recognize and the routine care I’m all over. However, it wasn’t always that way. Before I found my vet, I used several different veterinarians. 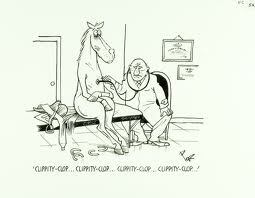 They where the barn vets, the cheap vets, and on occasion the on call vets. Now, each and every one of the veterinarians I used were great and I appreciate all they did, but they came and went with little connection to me or my horse. This was my choice and the lack of connection was because I just looked for convenient, rather than stability. That all changed when Bingo got sick and had strangles. It was then I realized I wanted someone to know my horse and his history. So, I stuck with one vet and I’m happy I did. So what makes my vet Awesome? • He’s patient with my horses and kind. • He takes his time diagnosing and thinking about what could be wrong. • He explains things and makes sure I understand. These characteristics make for a wonderful Veterinarian. Now, when he comes out for shots or routine veterinarian care I hear how well my horse is doing or not doing. I feel as if I can believe him and I know he understands my horses history and that makes for better care. Plus, we have developed a rapport and he knows my situation financially, he works with me and that’s a great thing. Now tell me why you love your vet! This entry was posted in Horse Sense and tagged APHA, AQHA, Equine, Equine Veterinarian, Horses, Paints, Veterinarian.